I love to cook meals for my family and I mostly use organic ingredients. But as any mom, I have those nights when I think "What? They want dinner again?" It's all part of the territory of being a mom, non-stop meal making and all. 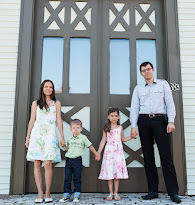 We recently got to try the new Sprout Organic Toddler Meals and we want to share our thoughts with you. This is something wonderful to have for one of those nights, when you're really not up to it. Granted, it's toddler sized, and you would still have to feed yourself something, but at least it has your kid covered. As a mom that works from home, I find myself often saying "What?! It's eight in the evening and we haven't had dinner yet?!" So on a night like that I remembered we had the Sprout Organic Toddler Meals to try. Since my husband was at work and I just needed to feed myself and my toddler, I took out the Vegetable Risotto with Quinoa & Parmesan as well as the Macaroni & Cheese with Butternut Squash. We do not own a microwave as we believe it is not good for your health, so the heating directions left me a little baffled. I wasn't about to submerge plastic into hot water to heat my toddler's meal, plastic leaches chemicals when in contact with hot liquids. I'm sure it wouldn't really be a big deal, as the water is on the outside of the container, but anyway, we don't eat out of plastic. So I opened the container and heated the meals on the stove top, split each one in half so that both Baby E and I could try it. Here is her serving, half Vegetable Risotto and half Mac & Cheese. Baby E carefully examined the foreign substance, as she does with all her food! We both ate a few bites and I noticed that I like the really low sodium content, it's not salted the way most ready-to-eat meals are that I've tried before. I love that because I barely use any salt in the meals I make. I love the flavor and enjoyed both meals. Baby E? Not so much. She isn't normally a picky eater, but it surprised me that she said she doesn't like when everything is mixed together. I guess she is so used to having everything separate on her plate, this wasn't up her alley. She has eaten mixed meals before, like quinoa with peas and corn that I've made before, but for some weird reason she didn't like this. Which of course doesn't mean your toddler will not like it! It's worth a try. The Sprout Organic Toddler Meals come in 8 different varieties, we tried only two so far. The portion is perfectly toddler sized, at least for my toddler it is just about how much she eats at each meal. The ingredients are superb, there really wasn't anything that jumped out as a bad ingredient. The only thing I didn't like is that the cheese is made with skim milk, I believe kids need full fat dairy and it is better for them. Overall, the ingredients are something I would normally use and cook for my family. The meals are perfect for taking on the road! We're traveling this May and I am contemplating taking some of these and [gasp!] I might even nuke them a little if there is a microwave in our hotel! The toddler meals are 6.5 oz each and are priced at $3.55. Price wise it isn't something I would buy often since I can feed my whole family a filling dinner for about $5. But for travel and for those evenings, I don't mind having a little 'emergency' stash. Sprout Organic Toddler Meals are available for purchase from Sprout, at Diapers.com, Amazon, and other retailers. 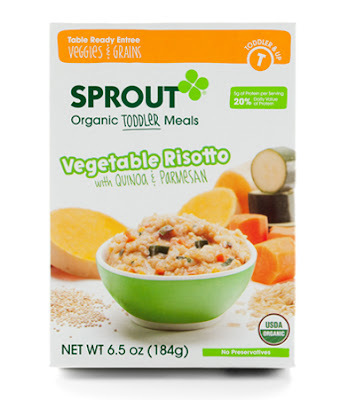 One of you will win 8 Sprout Organic Toddler Meals! Disclaimer: I did not receive any payment for this review. I was provided with a product sample for review purposes. The opinions are solely my own and your experience may differ. One of my picky eater likes everything to be separate on his plate, we slowly adjusting to accept mix food. I think they sound like a great idea. I used Sprout baby food for my son and he loved the unique combinations. They had great flavors and different textures for him to try out. They look like they'd be good emergency meals for toddlers! Definitely not your usual combo, but I do think that my son would love them. I also love the fact that they are organic. I think that these toddler meals look great... perfect for a night that you are busy or for a babysitter or just anight you know you are making something your child is not going to want to eat! I had some of the infant food, and it was quite good. Definitely up a notch from regular baby food! I liked that it was healthy too. It would be good I think to have this on hand to feed my son for his late night snack. We tried these recently and my daughter loved them. These would be great for those days that we almost skip lunch on the weekend. I also think these would be great to send along with my son to the sitter! I like clean ingredients and it looks like worth to try it. These meals look amazing. I would be excited to win this giveaway. I have never tried them, but I would love to test them out with m daughter. I've never tried them but they look good. A great easy meal when in a hurry! we havent ever tried them but they look like a great idea with great nutrition and super easy!